The championship of exaggerations is over and the first dust of time is settling on the Brexit referendum. In the circumstances, it may be somewhat amusing to evaluate the reactions rather than the results. Considering that opinions are formed in abysses of approximation, prejudgment and passion. Eventually a new fact is evaluated less for its accuracy than for its possibility to serve or disserve a system of interpretations, a feeling of emotional comfort or, as with the Brexit case, a network of alliances. But all this you know. We can think of any analysis as the sectioning of a subject into components or layers. A components-based analysis suggests their mutual independence, whereas a layer-based analysis suggests that the various layers of interpretation interact with each other, sometimes directly and often indirectly. In the case of Brexit, I think the latter is the case. Even so, all this is arbitrary, therefore I’ll say, “Boldness be my friend, arm me audacity from head to foot” (1) – before going any further. One popular interpretation is linked to racism. Permanence in the EU would result in a larger influx of migrants. And in certain political circles, he who objects to the (essentially) uncontrolled mass-migration into Europe is a racist. According to this theory, London voted for the EU, because the South of England hosts a larger immigrant population, which is inherently pro-EU (i.e. pro-immigration). However, immigrants are less likely to reside in Scotland, being far, cold and removed. And yet, Scotland, with less immigrants, voted to stay. But the racist theory is applicable here too. 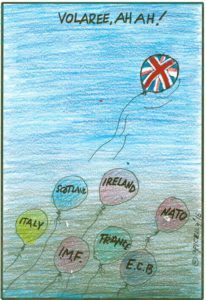 The Scots did not see danger in the EU, because immigration has not affected them as badly as elsewhere. The second interpretation centers on the age of the voters. 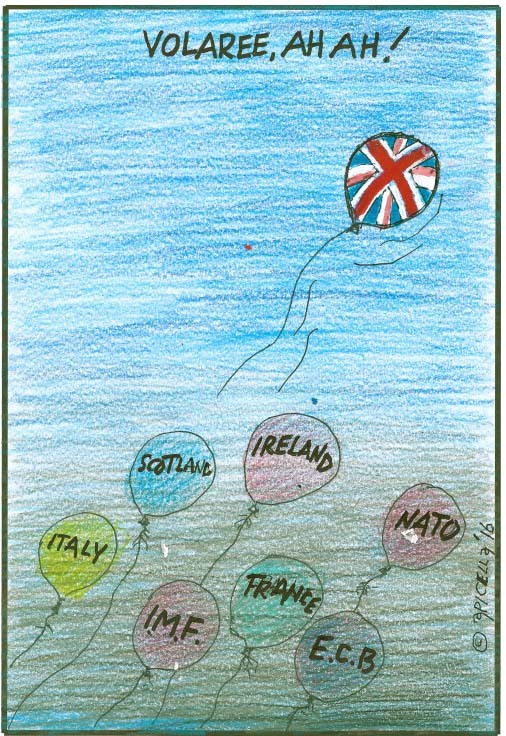 Whereby older voters chose Brexit because they are stuck in their old ways, like the “oak, whose boughs are moss’d with age and high top bald with dry antiquity.”(2) Reminiscing of the times when “Britannia ruled the waves” and was not subservient to a political center, established elsewhere and staffed by people who speak English with a funny accent. Of course, a literary-minded mature adult may retort that “…flowers distilled, though they with winter meet, lose but their show, their substance still lives sweet.”(3) But let that go. So far then, the clarity of numbers is but a mirage. Or rather, two and two may still make four, but for sundry different reasons. One curiously subdued interpretation, has to do with the staggering administrative costs of the EU. As readers know, it is an enormous superstructure, employing 1800 linguists, 1000 plus politicians and thousands of career bureaucrats, paid well above the average employee doing the same job. A post in the EU bureaucracy is a most coveted position across the continent – position usually obtained through an intricate nepotistic network of connections. One relatively unknown, and almost unimaginable expense, involves the monthly transfer of the whole EU bureaucracy from Brussels to Strasbourg and back again. The cost of these transfers alone amounts yearly to a billion $ plus. Each month, 2,500 plastic trunks filled with papers (documents, diaries and other items), are loaded onto trucks, unloaded at destination, where the papers are re-filed. Thousands of politicians, officials, assistants and translators are moved to the other location, via chartered express trains. Just the cost of the private express trains to make the journey back and forth during the year is estimated to be over 300 million $. Talk about the “The caterpillars of the commonwealth, which I (Bolingbroke) have sworn to weed and pluck away.”(5) So far, any attempt to reduce the number of days when the EU parliament sits in Strasbourg has been ruled unlawful – for a treaty protects ‘equal status’ for Strasbourg. Another relatively discounted interpretation of the vote has to do with the class struggle. Only the colorful George Galloway mentioned it. For him, Londoners who voted for the EU are those who begin their day with an Italian ‘caffe’ macchiato’ and who employ a nanny for their offspring. Amusing characterization that, however, raises perhaps the most important issue behind the referendum itself. For, when societal changes occur sufficiently slowly, they escape consciousness and usually elicit no reaction, opposition, or revolt. Examining the last decades of our times, we can perceive the undergoing of a slow drift to which we become accustomed. Also considering that the relentless hammering of media information saturates the brains, thus rendered temporarily unable to distinguish things. But in time perception gradually takes hold, just like when, passing from light to darkness, we become slowly aware, however dimly, of the surroundings. In the instance, the developing awareness translated into an instinctive rejection (Brexit), of new and very unpalatable surroundings. A rejection, by the way, that finds no way of expression, when choosing between Tories and Labor in national elections. Witness the fact that both leaders of the two parties were pro-EU. Reality shows that the proletariat no longer exists, but not because poverty has been abolished. The poor may still say, “I can get no remedy against this consumption of the purse; borrowing only lingers and lingers it out, but the disease is incurable.” But in the instance, the proletarian poor has remained poor without being a proletarian. For the capitalistic division of labor has destroyed the conditions that made Marx’ ‘scientific socialism’ feasible. Apart from the de-industrialization of the West, (including England), the worker’s labor no longer involves any power. And a class whose social activity yields no power does not have the means to take power. Besides, work is no longer the worker’s activity. In most cases, in the factory or office, work has become a passive, pre-programmed operation, totally subordinated to the working of the big machinery, leaving no room for personal initiative. Consequently, inability to identify with one’s work equates to losing the sense of belonging to a class. The workers’ objective, then, is no longer to free themselves within work, by seizing power inside the employing organization. The (yet undeclared but palpably evident) objective is to free oneself from work by rejecting its nature, content, necessities and modalities. But rejecting work is also to reject the traditional organizations of the working-class. The object is not to win power as a worker, but to win the power to no longer function as a worker. These ideas are anathema to the lingering ‘leftist’ organizations, where the Trotzkiaites fight the Stalinists with virulent animosity, accusing each other of unspeakable crimes, while dreaming of grass-root socialist movements, impossible because there can be no grass where there is no root. Still, Marx held that there was a negativity embodied in the working class. Such negativity has not disappeared, it has been displaced and has acquired a new radical form, in a new non-class. The non-class includes all those whose job was eliminated by machines, or whose capacity is under-employed, following the automation and consequent industrialization of intellectual work. The traditional working class is currently a privileged minority. The majority belong to a post-industrial, neo-proletarian society without job security and class identity, employed in casual, probationary, contracted, temporary, part-time employment. As such they cannot feel as belonging to a working class. It is in the context of this ideological climate that the notion of the 1% versus the 99% was born and took hold. If a worker has lost his dignity as a member of a class, it follows that his contribution is increasingly meaningless, rewarded accordingly and, even so, reluctantly, waiting for the next robot to replace him. For example, when Seattle made the minimum wage mandatory, McDonald announced a program to robotize 90% of the operations still conducted by humans in their fast-food franchises. In these conditions, the concealment and the manipulation of truth are enshrined as a system of government, with the complicity of the information industry. Even discounting the gross manipulation of employment statistics, the relatively high levels of employment are artificially maintained, due to the inextricable confusion between the production of the necessary and the superfluous, the useful and the useless, waste and wealth, destruction and repair. How else can we judge or justify the current bellicose maneuvers, wars and threats of war, terrorism and the immense expenditures on (this time real) weapons of mass destruction. In the realm of the never-enough-cursed, neo-liberal, Thatcherite economic superstition, the whole idea is to keep people occupied while preserving the relations of subordination, competition and discipline upon which the dominant system can exert its hegemony. Which is to say that ‘progress’ has arrived at a limit beyond which what appears a plus is actually a minus – presaging a future heavy with menace and devoid of promise. The manipulators of society use a clever gimmick or argument. They say, we are much happier than previous ages because people, then, could not avail themselves of today’s inventions. In reality the unhappy ones are ourselves when, used to today’s comforts and gadgetries, imagine ourselves transported in an age when those comforts did not exist while our needs do – even though these needs were born with or from the comforts. “Give me ten thousand eyes and I will fill them with prophetic tears.”(8) Which may seem overly pessimistic, but in the instance of Troy, Cassandra was right. And so was Marx, when he accurately foresaw the evolution from capitalism into monopoly, from monopoly into finance-capitalism, and from finance-capitalism to imperialism, eventually leading to WW1, WW2 and beyond. To ascribe to the pro-Brexit voters the cognizance of “the giant mass of (bad) things to come at large”(9) would be a stretch. But just like “men judge by the complexion of the sky the state and inclination of the day,”(10) perhaps some of them correctly saw in the EU what’s in store for them and voted accordingly. 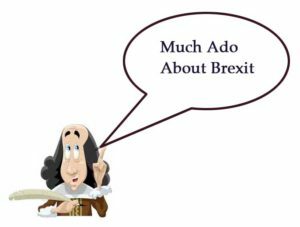 Hence the conclusion that so “Much Ado About Brexit” may prove, in the end, “Much Ado About Nothing.” And maybe the event won’t even appear in print, in the history books of yonder years. 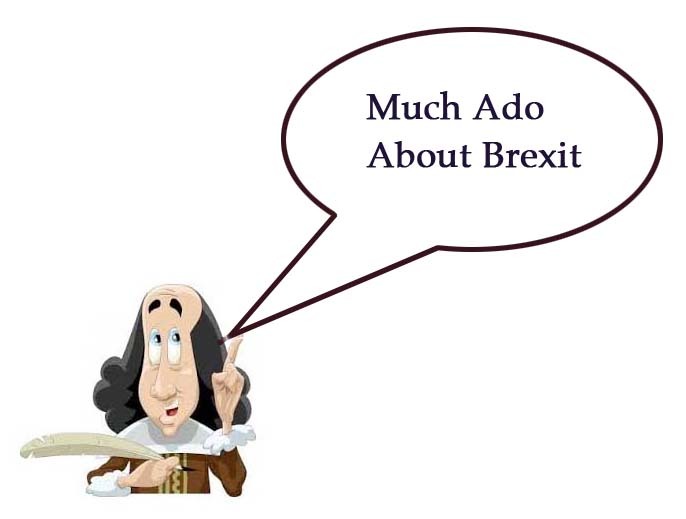 This entry was posted in Best Shakespeare Quotes, Philosophical, Psychological & Historical Considerations, Sayings about Life, Shakespeare in Politics, Shakespeare on Mass Psychology and Group Behavior and tagged best shakespeare quotes, Brexit, EU, european union, independence, opinions, racism, referendum. Bookmark the permalink.